The Restaurant Show returns on 1-3 October 2018 and promises to be an unmissable occasion for the hospitality industry. Featuring Bar & Pub and Catering Equipment Expo, this year sees The Restaurant Show celebrating its 30th anniversary. Registering for your badge gives you access to hundreds of innovative exhibitors across the shows as well as top speaker sessions and exciting live competitions. Plans are in place to make this 30th anniversary show the best year yet, with leading industry names and talents set to take to the live stage once again. While the full live line-up is still to be revealed, one thing is for sure, it’s guaranteed to be packed full of inspiration and new ideas. With a wide range of subjects up for discussion, whatever your role in the industry, The Stage will feature a session to motivate and move you. Not to be missed is all the exciting action in the Competition Theatre, where passionate professionals will be putting their talents to the test across the three days. This includes the industry’s most prestigious competition, National Chef of the Year. On 2nd October ten of the UK’s most promising chefs will battle it out in a tense live final, hoping to take home the famous title. The action takes place under the watchful eye of an impressive line-up of judges including Clare Symth, Tom Kerridge and Philip Howard. The day will also see the crowning of a new Young National Chef of the Year, with some of the industry’s brightest young stars competing. Plus, there’s even more heat in the kitchen, with the return of several other top culinary competitions including The Kikkoman Masters and Compass Chef of The Year. With over 450 suppliers expected to be in attendance at this year’s show, there will be plenty to try, taste and discover. Whether you’re looking to find interiors inspiration, new ingredients for your menu, equipment to improve efficiency or simply to see how some of the latest trends could work for you, this is the place to be. From food & drink, to tableware, technology and all the latest equipment for the kitchen, you’ll find it all under one roof. Over the last 30 years The Restaurant Show has established itself as a major force in the hospitality industry, it’s the ultimate diary date for anyone in the sector. 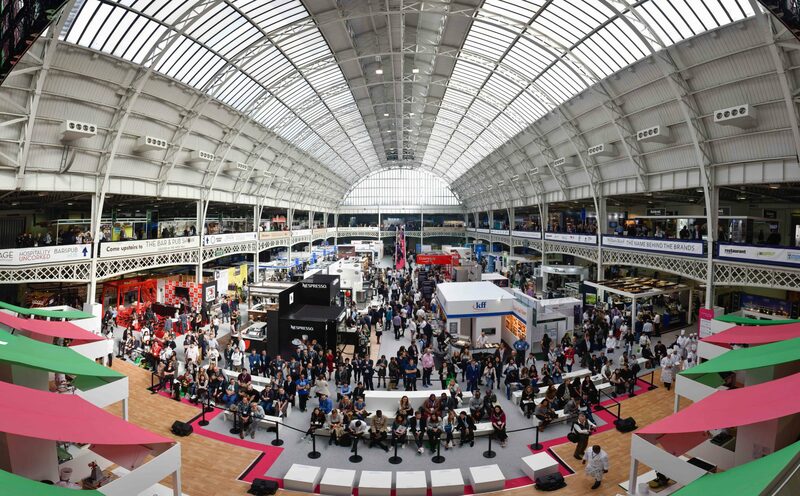 The inclusion of Bar and Pub and Catering Equipment Expo broadens the event’s appeal and means there really is something for everyone. This is the place to find inspiration, learn about the latest trends, source products and suppliers or simply network with friends and colleagues. Visit this year’s event and you’re sure to leave enthused about the industry and full of ideas to take back to your own establishment. Register to visit for free at www.therestaurantshow.co.uk.